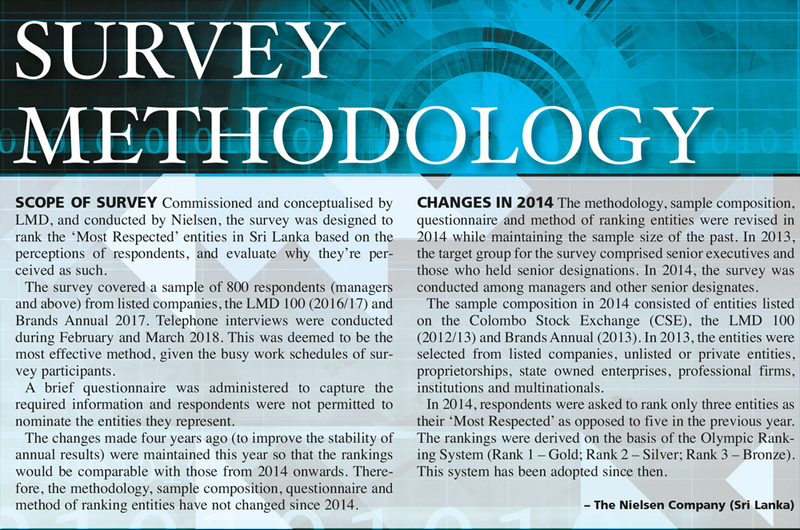 The last 12 months has been a volatile time for Sri Lanka and its economy with policy certainty – or indeed, the lack thereof – playing a role in shaping perceptions among corporates as well as their outlook for the near to medium term. Meanwhile, the LMD-Nielsen Business Confidence Index (BCI) has also taken a battering especially following the local government elections in February, and ensuing political tug-of-war and resulting instability. Meanwhile, in the World Bank’s 2018 Doing Business rankings, Sri Lanka has slipped to 111th position from 110th in the previous year – in spite of improvements in indicators such as starting a business, dealing with construction permits, paying taxes and trading across borders. 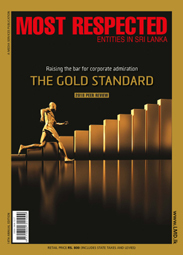 Turning to this year’s Most Respected special edition, it continues to use the Olympic Ranking System that was adopted in 2015 whereby Sri Lanka’s most admired entities are awarded gold, silver and bronze medals respectively – based on Nielsen’s exclusive survey for LMD to gauge peer perceptions. For a record 13th year, John Keells Holdings (JKH) is perceived as being the most respected entity in Sri Lanka thanks to gaining the highest number of golds. It is followed by MAS Holdings, Hayleys, Commercial Bank of Ceylon (ComBank) and Dialog Axiata. JKH accumulated 265 gold nominations (compared to 296 in the prior year). MAS seals its No. 2 position from the previous year while Hayleys has climbed two places to third and ComBank maintains fourth place. On the other hand, Dialog has dropped by two places to fifth in the 2018 rankings. Rounding off the top 10, Unilever Sri Lanka retains its position at No. 6, Aitken Spence moves up by three spots to seventh, Brandix Lanka improves by one place to eighth and Sampath Bank is down a notch to ninth. Meanwhile, Softlogic Holdings breaks into the top 10, having improved by three places from the preceding year. The 10 most admired entities include four of the largest diversified corporates, two private sector banks, the two largest apparel manufacturers, a multinational consumer goods company and arguably the largest telecommunications service provider in Sri Lanka. In terms of the 10 attribute rankings, JKH leads in six categories (financial performance, management profile, honesty, dynamism, corporate culture and vision) while MAS is numero uno when it comes to quality consciousness. Dialog assumes leadership for innovation with the Capital Maharaja Organisation heading the CSR category and Sampath Bank being perceived as the most nation-minded.